What Is the Golf Ruling for Ants in a Hazard? 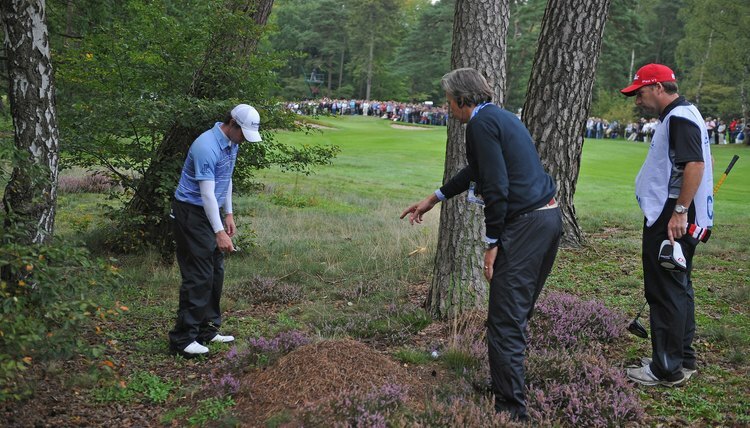 Rory McIlroy is granted relief from a large ant hill during the 2011 KLM Open. Hitting your ball into a sand trap or other hazard is bad enough without having to deal with an ant hill or, in some cases the ants themselves. While ant hills may pose a variety of challenges for a golfer, there is no provision in the Rules of Golf that specifically states what to do about the problem. But the rules interpretations provided by the U.S. Golf Association do offer some answers for golfers confronting ants, whether in or out of a hazard. USGA Decision 23/5 specifically designates an ant hill as a loose impediment. That’s good news for players outside of hazards, who may remove loose impediments without penalty. Under Rule 23-1, however, a player may neither touch nor remove any loose impediment in the same hazard as the ball. The penalty is the loss of the hole in match play or two strokes in stroke play. Insects and insect-like animals, including ants, are also treated as loose impediments, according to Decision 23-1/5. Within hazards, therefore, ants may not be touched or removed from the ball. Pursuant to Decision 23-1/5.5, however, a player may wave a hand or other item near the ball to try to get a crawling animal off of the ball. Whether such an action would cause an ant to leave the ball is questionable. When abnormal ground conditions interfere with a player’s ball he is permitted relief without penalty, even when the ball is in a hazard. Although abnormal conditions may include a “hole, cast or runway … made by a burrowing animal, a reptile or a bird,” ants and ant hills are not included within the definition abnormal ground conditions. A player’s only hope of relief from ants or an ant hill in a hazard is via a local rule. Decision 33-8/22 notes that certain ant hills are “conical in shape and hard,” in which case a local rule designating such areas as ground under repair may be appropriate. Ground under repair is a type of abnormal ground condition, allowing for relief without penalty. The USGA decision also suggests that courses offer a local rule permitting relief from areas near fire ant holes. Because fire ant bites are painful and potentially serious, the ants' appearance may be treated as a dangerous situation, allowing free relief pursuant to Decision 1-4/10.